Discover a culinary journey at the versatile Swiss-Cafe™ Restaurant, serving a mouth-watering variety of Indonesian and international dishes daily. Theme Night Buffet - IDR 100,000net/ pax! 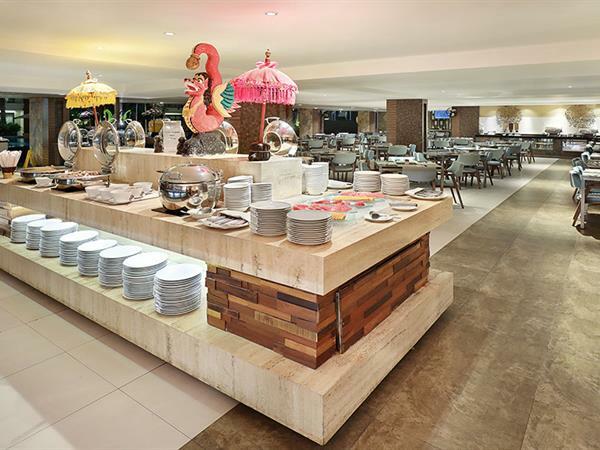 Tempt your appetite at Swiss-Belhotel Tuban, Bali. Indulge yourself with our Asia buffet dinner or BBQ buffet dinner to cater your needs of culinary in Bali. Discover a modern fresh take on Asian cuisine without losing the authentic taste of famous and ancient traditional dishes. Let your tastebuds do the travelling and enjoy a fine food journey with specialities from regions of Indonesia, Thailand, Vietnam, Singapore, Malaysia and Japan! All skilfully prepared by our master chefs from the very freshest ingredients and served to you in our welcoming and casual open-plan dining area. You’ll love it! Chill out at the pool and refresh yourself with our fabulous cocktails and mocktails or wine selections.